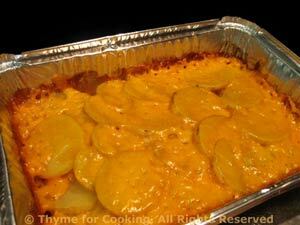 Gratin Potatoes, Thyme for Cooking easy side dish from the grill. You can do these in the oven, but the heat from the grill makes a delicious, slightly crispy cheese crust you will miss. With a little care you can get them out of the pan and onto a serving plate in one piece. 1/2 cup cheddar cheese (2oz, 60gr), shredded Substitute Colby, or other 'yellow' cheese. Swirl oil in a small metal or foil pan to cover the bottom. Layer 1/2 of the potatoes, then onions and top with the remaining potatoes. Mix broth and Worcestershire and pour over potatoes. Cover with foil and cook over indirect heat on barbecue grill about 30 minutes, or until done, checking periodically to make sure they don't dry out and burn. Or bake in 400F (200C) about 45 minutes. Note: If you don't have a metal or foil pan you can make a packet out of a double layer of foil. Brush with oil, including the part you will fold over.